As a notebook and now ultrabook manufacturer, Toshiba has always had an odd streak. I mean that in the most affectionate way possible; while their budget notebooks have been generally solid offerings for a good price (and typically preferable to similar kit from backsliding leaders like HP and Dell), their middle and high end kit has shown a willingness to experiment that includes pre-ultrabook notebooks like the Portege R700, ultra-widescreen kit like the Satellite U845W, and if you're willing to go back far enough, their now defunct Libretto line. What we've been missing, though, is a genuinely high end, flagship ultrabook from Toshiba. HP has their Folio line, Dell has their XPS ultrabooks, ASUS has their Zenbooks, and even Acer has a pretty broad range of ultrabooks to serve everyone from the most cash-strapped customer to the user looking for a premium computing experience. Toshiba did well with their Portege Z835 in the first wave of ultrabooks, but that had more to do with the low entrance price. To satisfy premium customers, Toshiba is launching a premium line of ultrabooks, and they start with today's KIRAbook. 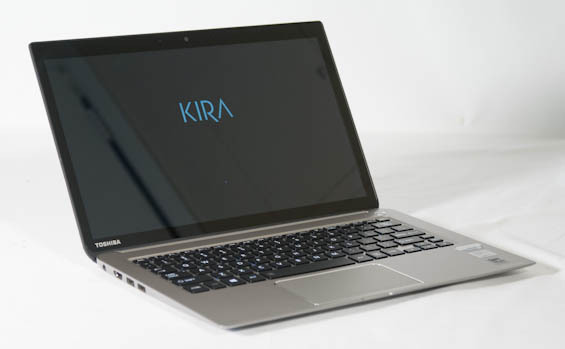 KIRAbook isn't just the name of this notebook, it's the start of a new brand within Toshiba, and it's a brand they've desperately needed. Satellite serves mainstream customers, Tecra serves business, Qosmio serves gamers, and Portege serves the ultraportable market, but none of these brands outside of maybe the Qosmio line is really "premium." With the KIRAbook and the KIRA branding, Toshiba's actually opening an entire wing of business just dedicated to supporting notebooks under this brand. The KIRAbook comes with a 2-year "platinum warranty" standard; KIRAbook owners don't go through Toshiba's primary customer support channels but instead have access to their own 24/7 help line along with rapid repair service and other perks. None of that would matter if the product itself isn't worth the expense and effort, though, and while I don't feel like Toshiba has a homerun on their hands, they do have a pretty strong start. The real fly in the ointment is the impending launch of Haswell; I suspect the KIRAbook launching with Ivy Bridge hardware on the eve of Intel's next generation is akin to Dell's launch of the XPS 13 shortly before Ivy Bridge became available. I think Toshiba is getting their foot in the door with this brand and at the same time decoupling it from Intel's cadence out of the gate. Warranty 2-year limited "Platinum Service"
The starting price of $1,599 stings mightily, but at least that model is likely to be the preferable one. That "entry level" KIRAbook has an Intel Core i5-3337U (1.8GHz) which has lower turbo frequencies and a 200MHz lower nominal clock speed than the top-end model, but the only other sacrifices are the touchscreen and the Windows 8 Pro license. Everything else is the same as the spec table above, and it's at least a lot more palatable, especially when you take into account that Toshiba notebooks routinely sell for $100-$200 cheaper when they hit retail channels. For your money, though, you do get an awful lot of notebook. The star of the show is going to be the 2560x1440 13.3" IPS display, which is essentially the highest resolution display currently available in a Windows notebook. The 16:9 aspect ratio means you lose 160 pixels of vertical resolution compared to Apple's 13" Retina MacBook Pro, but it's tough to complain too much when most of the Windows notebook market is still stuck in the 1366x768 stone age. Backing up the beautiful display is a fairly snappy 256GB Toshiba SSD; I'm having a hard time discerning if it's using a third-party controller or one of Toshiba's own, but either way, it's fast enough to get the job done. 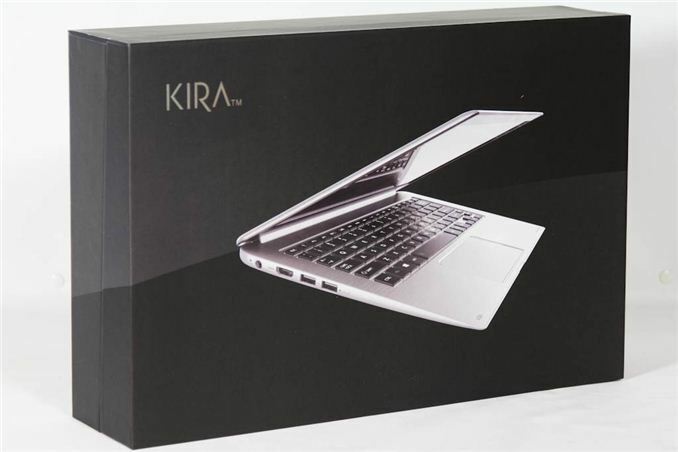 It has to be, since nothing in the KIRAbook is user-serviceable, including the 8GB of RAM and the battery. Where Toshiba fails and fails hard is the wireless card, which is bargain basement Intel and doesn't feature 5GHz connectivity. In 2013, and especially in a premium-class notebook, this is inexcusable. Toshiba has also gone the distance with the included software. While the boatload of Toshiba software included is on the bloated side, everything else actually makes sense. Full versions, not trials, are included of Adobe Premiere Elements 11 and Photoshop Elements 11, while the subscriptions to Norton Online Backup, Internet Security, and Anti-Theft basically cover the warranty length of the KIRAbook. The only trial software included is one month of Office 365.